UPDATE: Costa was able to have surgery – thank you to all that donated. Hi! My name is Costa Belle Adkins! 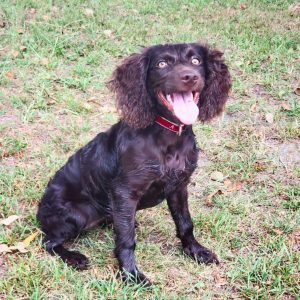 I am a 5 month old Boykin Spaniel in need of surgery for my leg. After Hurricane Florence, my human brothers, my furbrother, and I were going stir crazy, so our parents took us for a family walk around the neighborhood. We went to the duck pond, and I just had to jump in! Unfortunately my knee hit a rock ! Now I need surgery so that I can run, play, and swim with my brothers again, as well as help Mommy keep all these boys in line! Mommy and Daddy were able to secure over half of the cost, but need help with the last bit. Please help me get the surgery that I need! Thank you from the bottom of my little brown dog heart!